Made for fans, by fans, De Palma is a straightforward, riveting doc about one of the brightest movie minds we've ever known. Many a film nerd would kill (or at least pay a handsome fee) to share a room with director Brian De Palma and pick his brain. Lucky for us, filmmakers Noah Baumbach and Jake Paltrow got to do just that, and they share the fruits of their sit-down encounter via De Palma, a talking-head doc that sees the director recall the ups and downs of his career, chronologically, as clips from his catalogue pop up intermittently. Despite its straightforward approach, the film is riveting throughout as De Palma has a staggeringly sharp, singular mind for movies. Fans will no doubt be yearning to hear De Palma talk about his long shots; he’s one of the undisputed masters of the technique, after all (along with his close colleague Martin Scorsese). It’s indeed delightful to hear him dive into the finest details of his craft, like when he explains how cutting often disrupts the emotional flow of a scene while uninterrupted long shots preserve it, or when he describes the Roshomon-inspired effect of not showing the audience a clear view of the opening boxing match in Snake Eyes. His use of split-screen has become one of his hallmarks as well, and it’s fascinating to learn that he actually scaled back the technique in Carrie, as he felt it didn’t work well for fast action sequences. De Palma’s efforts have always been divisive, but his work in the ‘70s and ‘80s is widely considered his best and most influential, so Baumbach and Paltrow naturally linger on those decades the most. 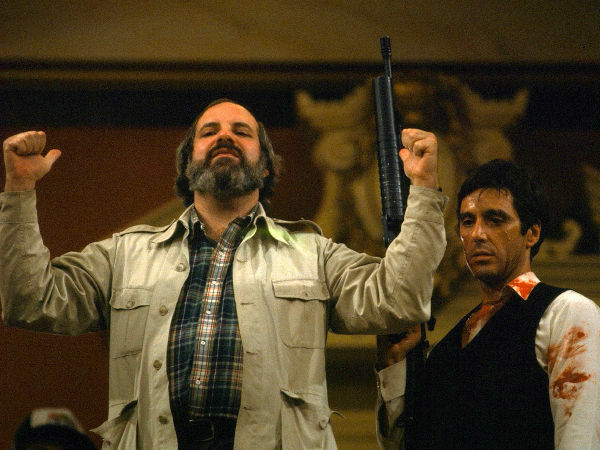 Obsession, Carrie, The Untouchables, Scarface…his pre-’90s catalog is staggering, and De Palma offers some interesting insider facts about them all. Most fans can draw a clear line of inspiration from the baby carriage shootout in The Untouchables to Battleship Potemkin, but the lesser-known tidbit that Robert DeNiro’s Al Capone was originally to be played by Bob Hoskins will surely come as a surprise to those with an affinity for what-if trivia. De Palma is definitely made for and by fans of the American auteur, but there are more than enough funny behind-the-scenes stories to entertain even the most unknowledgeable viewer, like when De Palma notes an off-camera fight between Michael J. Fox and Sean Penn on Casualties of War that provides hilarious insight into Penn’s gung-ho acting method. Aside from the entertaining anecdotes, De Palma’s an excellent storyteller with an infectious laugh and an even more infectious passion for movies and moviemaking. The gift and curse of De Palma’s reputation is that he’s been widely regarded as Hitchcock’s heir; since the beginning, he’s borrowed and, on occasion, improved upon the techniques, motifs, and themes of the “master of suspense.” De Palma opens with a clip from Vertigo, which both makes perfect sense and is totally obvious. But the beauty of these opening moments is hearing the sincerity and wonder in De Palma’s voice as he recalls the intoxicating effect the film had on him as a young man. Hitchcock’s influence is easily detectable in his work (particularly in 1976’s Obsession), but it extends even further, into philosophical territory; De Palma talks about taking scenes and shots from his early work and reiterating and improving upon them in later films, much like Hitchcock did with the crop duster scenes in The 39 Steps and, later, North By Northwest. Some find De Palma’s Hitchcockian tendencies derivative, while others (like Quentin Tarantino, who’s publicly stated he prefers De Palma) see him as one of the most unique, brash and uncompromising filmmakers in history. This writer falls in with the latter, especially after watching his wonderfully absorbing doc.